SYNOPSIS: The Woodland Period was a prosperous time for ancient Americans, beginning with the end of the Archaic Period around 1,000 BC and lasting until approximately 900 AD. The Woodland Period would become known to modern scholars as the period of the Mound Builders. This time period saw cultures, such as the Adena and Hopewell, learning to build earthen burial and ceremonial mounds. Woodland people also utilized agricultural techniques and produced large varieties of maize and other crops as a substantial part of their food source. With man now living in North America for over 10,000 years, he had established himself from north to south and east to west. The number of people living on the continent was astonishing, as were the number of villages that sprung up in virtually every area. Many settlements grew along the major river valleys, as well as the minor tributaries and streams. The Woodland Period was a prosperous time for ancient Americans, beginning with the end of the Archaic Period around 1000 BC and lasting until approximately 900 AD. Woodland people learned and utilized agricultural techniques and produced large varieties of maize and other crops as a substantial part of their food source. Some cultures also learned to build earthen burial and ceremonial mounds. The Woodland Period would become known to modern scholars as the period of the Mound Builders. This was a period of great innovation, technologically and socially, around the world. While hunting and gathering continued from the Archaic Period into the Woodland Period, the advent of food cultivation was a huge technological breakthrough for the people in Woodland times. This not only reduced their dependency upon wild plants and animals, but it also allowed for more control over the amount of food being stored at any given time. While hunting and fishing were still major factors in their lives, the quest for food was not as critical as it was during earlier time periods as evidenced by the time and effort dedicated to building projects. It is during this time period that the construction of burial mounds began. Little River Cache, ca. 1000-3000 BC. A cache of 5 "Little River" points found in McCurtain County, OK, by Gergory Perino and his wife. Havanna Zone Stamped Hopewell jar from Illinois. Although man banded together in smaller groups and semi-permanent villages during the previous time periods, the growing population resulted in larger groups and more permanent Woodland Period villages. This grouping necessitated the development of a societal structure with leadership positions. Woodland people lived in circular huts with a domed roof made from saplings stuck into the ground and covered with a bark or matted exterior. Ceremonial rituals and mortuary practices were also being developed. The archaeological record, based on artifacts recovered from various mounds and burial sites, indicates that the mortuary ceremonies during this period were complex and elaborate. The Adena and Hopewell are both examples of cultures who left behind evidence of their burial rituals in the form of mounds which can still be seen across much of America's landscape today. Smoking continued as an important ceremonial and pastime activity, and the pipes used by the Woodland people became more ornate through time. The pipes from this period show more stylization and carvings, as well as a change in overall style. 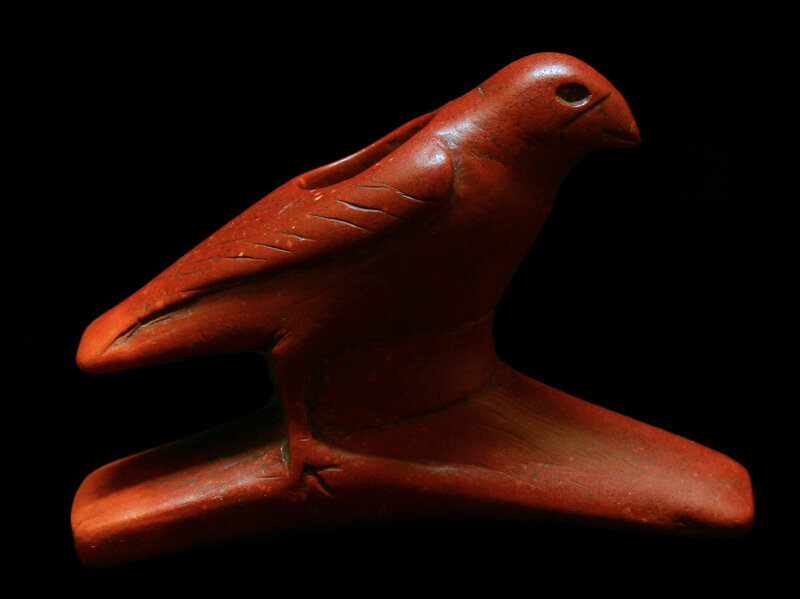 Carved from a single block of Catlinite, the McAdam bird effigy platform pipe is an example of the Native American's skill and artistry. Known as the "McAdams Pipe", it was recovered in southern Illinois. The "McAdam's" bird effigy, (ca. 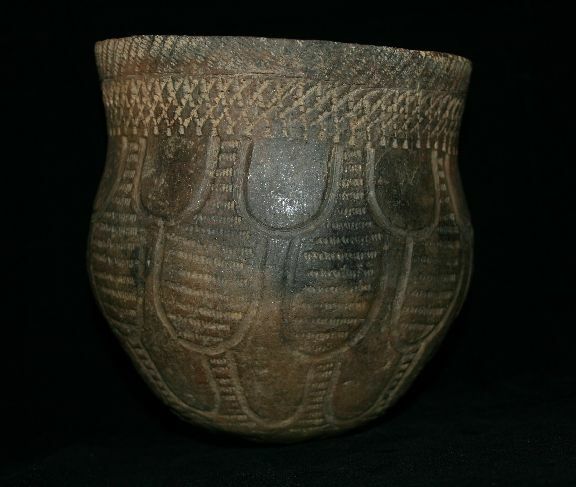 200 BC - 200 AD) found in southern Illinois, is carved from red Illinois pipestone. Large Snyders point from Missouri, made from heat-altered Burlington chert. Another tool that ancient Native Americans continued to use into the Woodland Period was the celt, or non-grooved axe. While the basic design remains the same as the Archaic Era celts, the Woodland people changed the style of the poll end, or back end to a more elongated and tapered style. Later Woodland people would prefer a square poll end. Hardstone Celt from the Woodland Period.